The all-new Cadillac ATS is Cadillac’s answer to the BMW 3-Series. With a high-power turbocharged four-cylinder or normally aspirated V6, a manual transmission, and rear-wheel drive, the Cadillac ATS is an out-and-out sports coupe. Cadillac wanted to make certain, however, that its new high-octane, road-hugging two-door remained Cadillac quiet. To accomplish that goal, Cadillac designers loaded the ATS with sound-deadening foam and other materials to ensure cabin quietness. They didn’t stop there, though. The team at Cadillac enlisted audio experts from Bose to help out even further. Bose noise and vibration experts installed three Bose microphones in the cabin of the ATS: one each in the driver and passenger doorframes and one behind the driver. Constantly listening for unwanted noise, the microphones send a signal to speakers that emit a counterbalancing noise. This technique is so effective; it’s lowered noise pollution in the ATS by 50 percent (three decibels). Cadillac and Bose didn’t want to cancel all noise, though. Wind noise is actively targeted while engine and other performance driving sounds are ignored. Additionally, Cadillac has meticulously injected sound deadening material throughout the ATS bodywork, including; the roof to eliminate rain noise; and the rocker panels (the bottom of the door frame) negating tire and road surface noise. Cadillac has also installed a specially laminated windshield and side windows to knock out the sound of traffic. The undercarriage has been fitted with an “aero shield” that works to keep out road noise but also to accentuate engine and exhaust notes during idle. Lastly, to eliminate vibrations and the ticking sound of the Spark Ignition Direct Injection system, acoustic covers and fitted foam have been added under the hood. 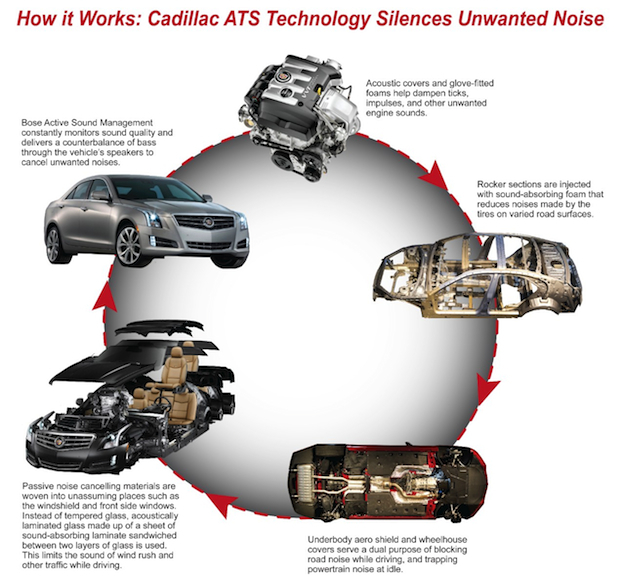 Admittedly, Cadillac isn’t the first automaker to utilize sound-eliminating technology, but for its extensive sound-reducing features on an entry-level vehicle, it’s certainly breaking the mold.